Planet Parni iz Baku "Natasha, mi prishla!" in Heydar Aliyev Palace buy tickets online. 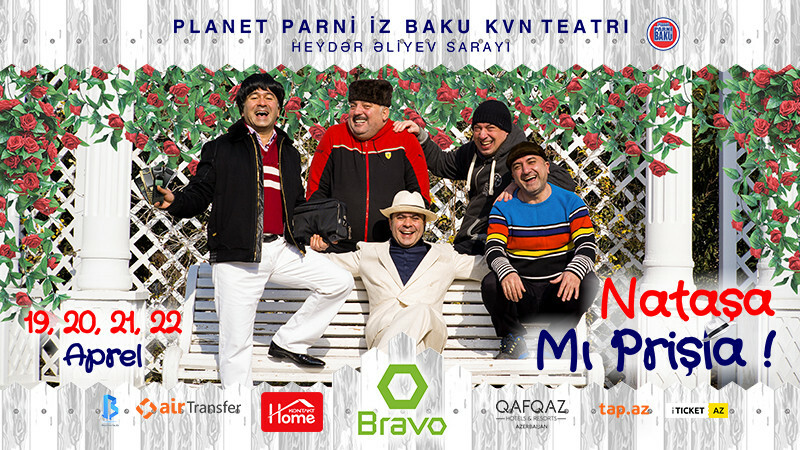 Delivery of tickets for the event Planet Parni iz Baku "Natasha, mi prishla!". Planet Parni iz Baku "Natasha, mi prishla!" Traditional April concerts of the KVN theater "Planet Parni iz Baku" are coming! The concert “Nataşa mı prişla”, that will be on following dates April 19,20,21,22, bring a lot of positivity and laughter with its creative approach and completely new scenes. Don't miss the "Main Funny Event" of the country! As usual, the 20th century champions of the Planet Parni iz Baku KVN Theater - Tahir Imanov, Jabir Imanov, Bahram Bagirzade, Azer Mamedzade and Alekper Aliyev will be on the stage!